Apostolic Titbits: Be Really Blessed!! 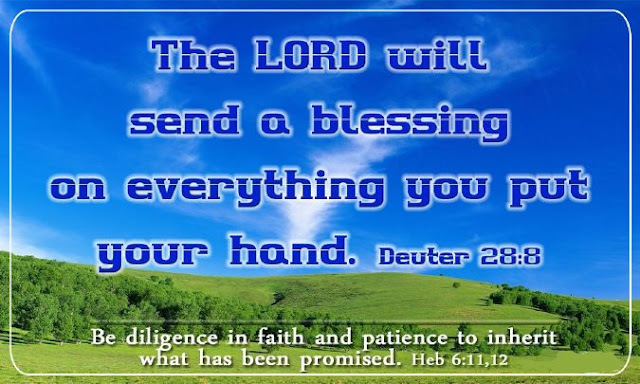 ‎Many people of God mistakenly think that having all our needs is the real blessing of the Canaan Land that God has promised to all believers. But it is not. If living without any needs and wants in the physical realm is the greatest blessing that God has promised, then a lot of people in the world even without God are living like that. Then what is the Canaan land we are going to inherit in the New Covenant? Whatever things God has promised to give us is the promised land of Canaan for us in the New Covenant. So what are you waiting for? Fight by Faith to inherit all the blessings of God. "For all the promises of God in Him are Yes, and in Him Amen, to the glory of God through us." (2 Cor 1:20). "Blessed be the God and Father of our Lord Jesus Christ, who has blessed us with every spiritual blessing in the heavenly places in Christ" (Eph 1:3). The next time someone says, "I am blessed,", don't be deceived to gulp it down through your throat, but check whether they are really blessed spiritually or else they are just saying that they are not in want physically and living as spiritual beggars internally. The real blessing of God is first and foremost a spiritual one, after which comes the soulish, physical, financial and social blessings. Apostle John prayed for believers like you and me saying, "Beloved, I pray that you may prosper in all things and be in health, just as your soul prospers." (3 John 1:2). Here he prays for the prosperity of all believers primarily in their soul spiritually after which he prays that they might also proper in heath and then in all things likewise. Apostle John did not bless the believer's first with physical and all blessings because he knew that the spiritual blessings of God when kept as the prime focus in one's life, will automatically bring all other blessings in to the believer's lives for the GLORY OF GOD. I wish all of my dear Apostolics in Christ brethren a wonderful month full of God's Presence and lovingkindness. May God keep you all safe and secure in Him and open your spiritual understanding to more and more spiritual realities and supernatural experience of heaven on earth.